Picture it. You're holding a cookbook featuring amazingly easy recipes — with tantalizing variations on familiar themes, using ingredients you already have on hand, with vivid imagery and easy-to-follow instructions, with simple suggestions for everyday dishes and holiday specials — all wrapped up in one beautiful full-color volume. 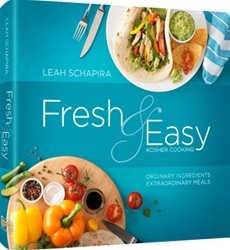 Welcome to Leah Schapira's Fresh & Easy Kosher Cooking: Ordinary Ingredients — Extraordinary Meals! Leah's approach to cooking is straightforward and basic; her finished results are consistently and deliciously excellent. With so many great ideas for simple-to-make meals, Fresh & Easy will quickly become one of your most popular cookbooks!